Tom's immediate older brother, Paul, and his wife, Pam, had their third child (and second daughter), Maria Bianca Rodgers, on April 16, 1981. The family was told of the new daughter the next morning and I immediately set to work on a baby quilt. I needed it to be easy because my quilting skills were still virtually non-existant. 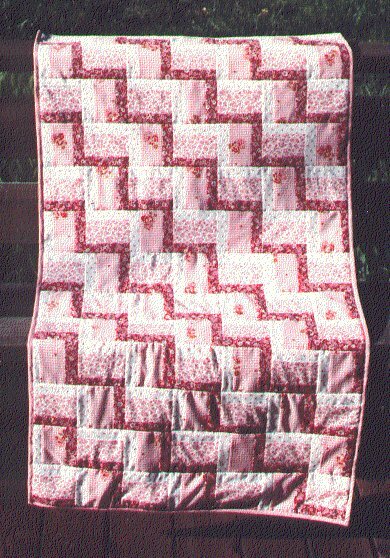 I had, however, discovered Rail Fence (which remains one of my favorites) which is a very easy, very fast and VERY impressive looking quilt. I love the way you can get a diagonal zig-zag design from the placement of the fabrics. 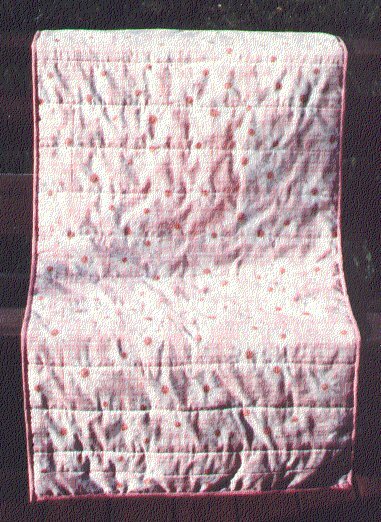 My method was to make a row of Rail Fence blocks, then using a sew-and-flip method, sew the row to the batting & backing. Since the blocks in the rows weren't overly high, the space between each row wasn't terribly big. By the end of that weekend, I had the baby quilt finished. When my sister-in-law came home from the hospital, Tom & I went to see her, visit the new baby and present the baby quilt. I remember so distinctly the look of astonishment on Pam's face when she realized that the baby quilt had been made specifically for Maria ... something for which the color choices couldn't have been decided until after she was delivered! It was a very gratifying moment for me .. knowing that my gift was well-received and well-appreciated. Quilters (and hand-crafters in general) realize that not all people appreciate hand-made gifts .